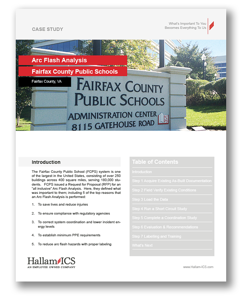 The Fairfax County Public School (FCPS) system is one of the largest in the United States, consisting of over 250 buildings across 400 square miles, serving 180,000 students. 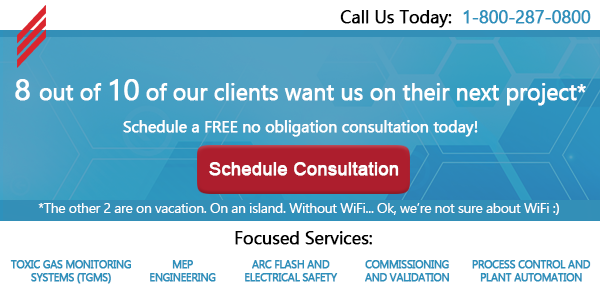 FCPS issued a Request for Proposal (RFP) for an "all inclusive" Arc Flash Analysis. To complete a project of this size and scope, Hallam-ICS utilized the 7 steps that ensure the success of a thorough Arc Flash Assessment. The control system in the Central Utility Plant (CUP) was approaching obsolescence and needed to be upgraded to mitigate the risk of a hardware failure interrupting manufacturing. We were hired to upgrade the entire control system while keeping the CUP running. During the 3-year program, the systems were upgraded to the site standard without a single interruption to services provided to the manufacturing floor. The university facilities group needed a data system to aggregate utility and HVAC data from multiple control systems into a common time-series historian database for data reporting, trending, and data analytics. The OSIsoft PI System was chosen. This long-term project was designed to evolve over time, provide additional data services, and to be used by a growing number of users. A key enhancement was the ability to select manual downtime reasons as well as capturing automatic alarms. The resulting system met all that was important to our client; it was flexible, scalable and provided the information they needed to optimize production. This project involved commissioning of a nearly 135,000 sq. ft chemistry building so that the occupants can focus on research, and not be concerned about their fume hood exhausts and lab temperatures. In addition, the Department of Homeland Security Center of Excellence in Explosives Detection, Mitigation, and Response will be housed in the new facility. A creative approach was required to re-use/ refurbish as much of the existing MEP infrastructure as possible in order to meet the budget and to preserve funds for architectural renewal of the building. The design process helped to create a state-of-the-art, collaborative laboratory space that will benefit biosciences growth in Connecticut well into the future. Introduction of the non-dairy line required the installation of new equipment in an existing frozen dessert manufacturing facility. Schedule, product yield and maintaining on-going operations without interruption we all important. Based on expience, Hallam-ICS was selected to support the control system implementation for the project. This client set out to achieve LEED Silver Certification and selected Hallam-ICS to serve as the Principal Commissioning Agent, providing services according to LEED Fundamental (EAp1) and Enhanced (EAc3) Commissioning requirements for the characterization and fabrication suites, labs, process utilities and support spaces. Final project exceeded initial goals and was recognized with LEED Gold Certification. A producer of industrial minerals in Vermont with locations all over the world asked Hallam-ICS to migrate a legacy Access Database to a modern Web Application. The automation team has been using an Access Database to document the inputs/outputs (I/O) by Programmable Logic Controller (PLC) and card spread in different locations of the plant. The Access Database was first developed in the early 2000s. The team added features to it but also broke other existing ones. We instituted a “zero defect” policy and developed an in-house web-based design tool that provided automated error checking and generation of PLC code and commissioning documents. This application greatly improved overall quality and enabled Hallam-ICS to meet the aggressive schedule despite regular design changes. This healthcare facility required electrical systems to remain operational 24 hours a day, 365 days a year. Knowing that qualified personnel will perform live work on electrical systems, Hallam-ICS recommended a survey of all electrical equipment, including: normal power, emergency life safety and critical systems in order to complete a short circuit, coordination and Arc Flash Analysis. Key design elements included space constraints at the existing site and a thorough knowledge of the relevant codes, including ANSI/CGA G-13 Storage and Handling of Si lane and Silane Mixtures. The final design exceeded all of the pertinent safety codes and is consistent with Analog Devices commitment to excellence. The Client’s team expressed areas of key importance on the project as needing to maintain different modes of room pressurization, depending upon the usage and to have a thorough hand-off to the operations team. The solution involved a complex series of control system algorithms that were a critical part of the commissioning program. Hallam-ICS was brought on to the project team to provide the required S88 design expertise. We took the requirements from BYK and designed a 2,400 I/O points system that includes and utilizes the Rockwell Software PlantPAX platform and specifically meets the current objectives while also being flexible and scalable for future needs. A major food and beverage manufacturer asked Hallam-ICS to build a data analytics application for determining the Scheduling Run Rate of their packaging lines at multiple sites. The Scheduling Run Rate is used by personnel to plan different types of product to run on the production lines. We took an approach that would simplify the problem and make the solution algorithm transparent and easier to understand.